Who would have thought that as I blasted the Google Play store for its poor handling of the 2nd Nexus 4 launch, that the number 1 takeaway from it would have been my failure to correctly type a CAPTCHA? Enter the word FACKWORS, which readers have been ribbing me over for weeks now. It’s a word that has become somewhat famous in the depths of the DL community, even prompting the creation of its own shirt. 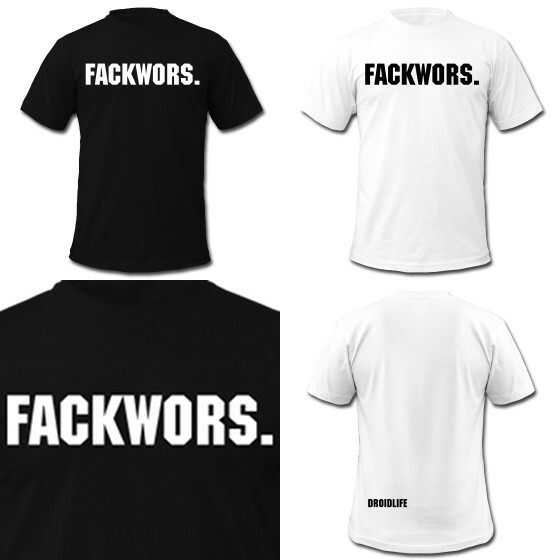 That’s right, the FACKWORS shirt is real and available in a variety of colors. I tossed out the idea of making it into a shirt, and enough of you responded with a “Yes!” One reader already managed to buy and receive his. That’s dedication to the cause. And look, we fully understand how silly it is, but that’s sort of what makes it brilliant. We set up a special shop for it. There is the ultra-inexpensive version with black or white lettering that drops in at $12.50 plus shipping. Then we also gave you the option of going with a higher quality American Apparel cotton, which can be had for $20.20. There is no mark-up or commission on our end.